Amazon Fire TV Stick review | What Hi-Fi? Amazon has a finger in many pies, so it’s not hugely surprising the American giant wants a piece of the streaming action. It wants to get into your living room, and it means business with the Amazon Fire TV Stick. We recently tested the Amazon Fire TV box, which was lovely, but forced Amazon’s services on us a little too strongly. The Fire TV Stick is pretty much the same deal but, for less than half the price, we can’t resist. There are two species of streaming devices: set-top boxes and sticks. Boxes have more connections and take up more space. Sticks strip it right down to the bare minimum, but have a much smaller price tag. At the time of writing, the Fire TV stick is less than half the cost of the Fire TV box. It’s essentially a chunky memory stick. It plugs into a spare HDMI socket on your TV or AV receiver. It’s powered by a tiny cable, which goes into your TV’s spare USB socket. If you don’t have one, fret not – there is a bundled USB mains adaptor. Turn on your TV and you’re guided through the installation process with nice graphics. Setting up basically involves connecting to the wi-fi network in your house – it’s a process that should take no more than a matter of minutes. If you bought your stick through your Amazon account it comes preregistered to your name, which is a nice touch. There’s no ethernet or any other hard-wired connections: streaming sticks are inherently basic devices. There’s not much to say about the aesthetics. It’s a matt-black stick, plasticky but solid. You won’t be worrying about the build quality once you plug it in and forget it’s there. We don’t tend to fondle our streaming devices anyway. What we do fondle are remotes. You get a Bluetooth-connected black wand, but this isn’t the clever remote you get with the Fire TV box, with its voice control function. You’ll have to enter film titles the old (clicky) way. That’s a shame, because voice control is one of the box’s coolest features. You can get a microphone-equipped remote separately for £25, but that’s quite an ask considering the Stick costs just £35. Thankfully, you can use the Fire TV Remote app (free on Android, iOS and Fire OS devices) on the stick as well. It’s not the slickest app we’ve seen, but it does do voice control. 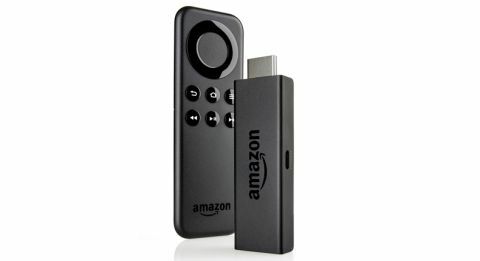 And it works well – although, as with the Fire TV box, voice control is restricted to Amazon Prime Instant Video. And there’s no doubt about it, Amazon’s service is the star of the show. The company has no reservations about imposing itself. It dominates the cleanly organised home screen, and you can’t get to the other apps without doing a shuffle of shame past the ‘Movies’ and ‘TV’ sections (Amazon Prime Instant Video in disguise). The Apps section has most of the streaming giants: Netflix, BBC iPlayer, Demand 5, YouTube, Spotify. Sadly, there’s currently no sign of Now TV, 4oD or ITV Player. The remaining apps aren’t particularly useful – besides Sky News and Vevo, you’ve got strange things such as Hypnosis TV. Besides the apps, you get games. The Fire TV was designed partly with games in mind and you can buy a separate games controller, not unlike an Xbox handset, for £35. There is 8GB of internal storage for you to download games onto. This is an advantage over the Google Chromecast, for example, which doesn’t let you download anything. Once you’re up and running with a video streaming app, you’ll find a 1080p picture that’s on a par with other video streamers: crisp, with a good amount of detail. As for sound, you get Dolby Digital Plus up to 7.1 (dependent on the app and the content). Operation is speedy – not quite as speedy as the more powerful Amazon Fire TV box, but faster and more fluid than the Roku Streaming Stick, for example. Browsing is intuitive and you’ll be nipping about in no time. The second time is a charm for Amazon. We’ve always liked how Fire TV works, and the small price tag makes up for Amazon’s somewhat in-your-face hard-sell tactics. If you have an older TV and you want to bring add some smart functionality, the Amazon Fire TV Stick is well worth your consideration.